The village of Greenhive Green are forming a committee. Each week they’ll gather in the village square, drink tea and take part in activities. 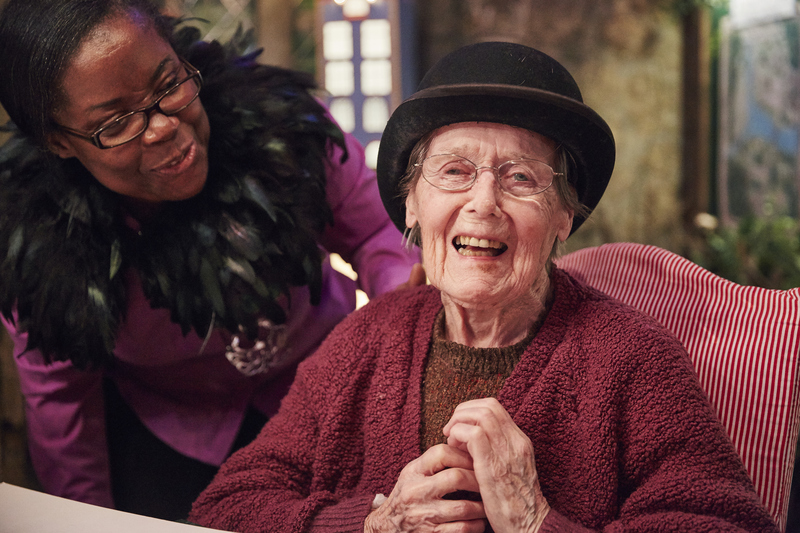 The first phase of our Artists Residencies project brought Punchdrunk Enrichment, part of the internationally renowned UK theatre company Punchdrunk to Greenhive Care Home, South London to host a seven week engagement project with its residents from 19 January until 11 March 2016. Research from this first phase of the programme sharing Punchdrunk’s experiences and those of performance-artist Lois Weaver was published in June 2016 and launched at Queen Mary University of London. This report can be read and downloaded here. A full project report documenting the experiences of all four participating companies (Punchdrunk Enrichment, Lois Weaver, Upswing and Duckie) was published in June 2017. You can read and download the report here and listen to the podcast of the launch event here. Greenhive Green was an immersive, village green installation, built within the care home. 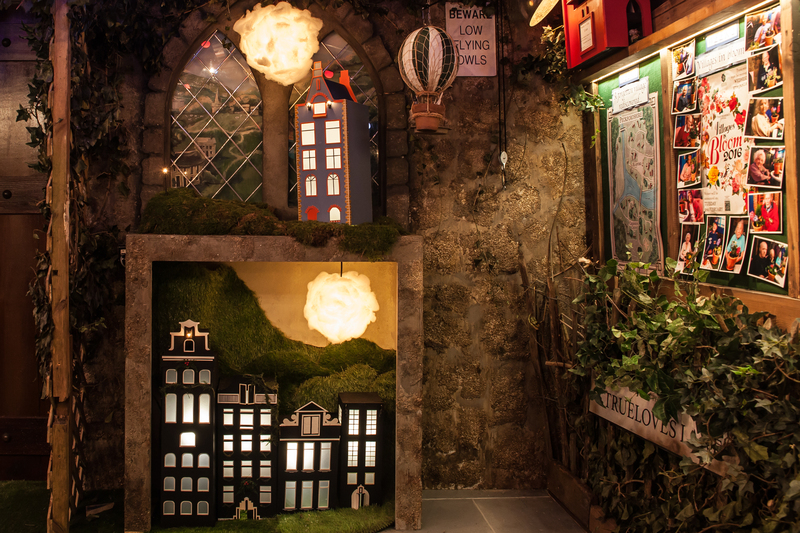 It consisted of a hyper real, theatrical village set, complete with a post box, telephone box, a florist shop and cafe. 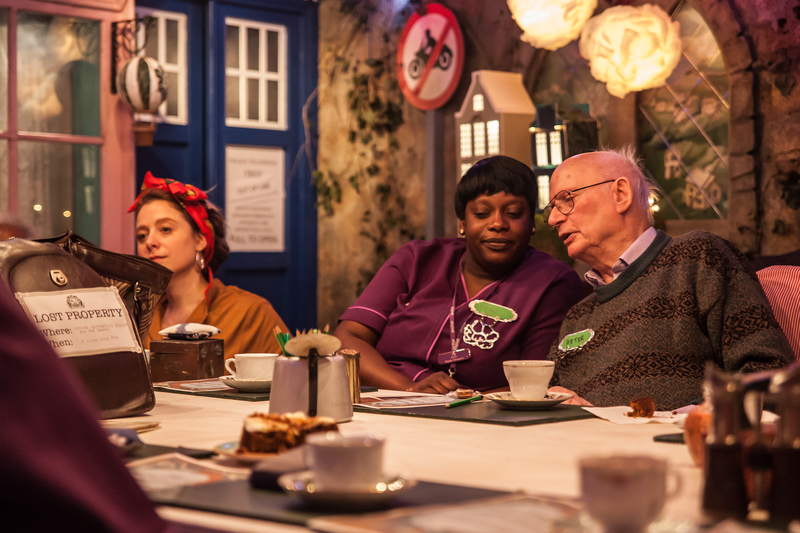 Punchdrunk Enrichment hosted a series of workshops and performances to create a theatrical ‘part game, part soap opera’ to engage with the residents and staff of Greenhive Care Home, a care home run by Anchor, the UK’s largest not-for-profit provider of housing and care for older people. Punchdrunk strives to create bespoke, beautiful worlds for its participants that are multisensory and indulgent; spaces to linger, love and explore. We hope Greenhive Green transports the residents from their typical everyday worlds and gives them an empowering and fun experience in the comfort of their own space.We are very excited to do something so new for the company and explore our practice in this environment, supported by the expertise of Magic Me and Anchor. Punchdrunk formed in 2000 and quickly established an international reputation as a ground-breaking theatre company who create epic worlds and immersive theatrical experiences. Since 2008, Punchdrunk Enrichment has taken this immersive practice into communities and schools, creating performances with and for children, young people and participants. This was Punchdrunk Enrichment’s first project working within a care home setting and with older people including those with dementia. Magic Me provided support for the company as they developed their work and ways of working specifically for this audience. We hope this project will create a legacy of understanding about the delivery of the arts within a care setting, expelling the limited view some people have of what older people can achieve. The two year Artists Residencies project provides a unique opportunity for Magic Me to share over 25 years of intergenerational practice and experience of running arts projects in care homes with some of the UK’s leading performing arts companies. The project seeks to challenge ageist attitudes that, being old, residents will not wish to enjoy up-to-date work, and provides care home residents with access to top level arts experiences, even if they are physically or mentally frail. Other companies taking part in residencies are cabaret collective Duckie; performance artist and activist Lois Weaver; and circus and aerial theatre company Upswing. Each company will be hosted by a London care home run by Anchor. All photo credits above: Stephen Dobbie for Punchdrunk. The project is funded by the Paul Hamlyn Foundation, Anchor’s Legacy Fund and the Wakefield and Tetley Trust. Follow @GreenhiveGreen on Twitter to follow the action and interact as the story unfolds and develops. A full project report documenting the experiences of all four participating companies (Punchdrunk Enrichment, Lois Weaver, Upswing and Duckie) was published in April 2017.